Gift selection–doesn’t end because the holidays ended. The after holiday sales help make the gifting job easier on your wallet. Here, like in the SIZZLING POST-HOLIDAY ENHANCEMENT ACCESSORY SALES and SIZZLING POST-HOLIDAY WARM ACCESSORY SALES posts, you’ll find some Frugalista Gift Ideas–at great prices– to help make the gift selection process easier. And delight several people on your list. For immediate occasions. Or, to help you plan for special occasions. Great gifts like accessories. Jewelry is the go to accessory gift. 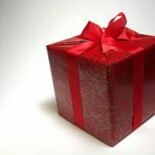 Check these suggestions to find the perfect fit for your gift recipient. Or, get some perfect fit ideas of your own. After all, you’ve done your homework and Know Who They Are? January is an off jewelry sales month and a good month for bargains. Here are a few that are pretty Frugalista! There’s still not a lot of jewelry selection out there for guys, but here are some interesting ones at Frugalista gift prices. Whether he’s artistic, appreciates art or simply whimsical, the Artist’s Easel cuff links hit the mark. Brushed chrome. Or perhaps he’s more of a card shark. Imagine the conversation the Bridge Player Cufflinks will spark. And, if he’s a card player, he can wear them for luck. This site has hundreds of cuff link choices, many on sale. Lots of specialty cuff links like dartboard, lawyer–even bullets. He isn’t afraid of color, even if it’s orange. Like the unisex IceLink Small Orange Bicycle Bracelet. Orange polyurethane woven through a stainless steel bicycle chain. Black Agate Beaded Bracelet. Alternating stainless steel and agate beads meet at a interestingly detailed stainless steel clasp. The clasp almost looks tribal. The Fleur De Lis Cufflinks Boxed Set makes a classy point whether he’s a sports fan, ex-pat or French. Geoffrey Beene design. A collector or fan of Converse will love the unisex, All-Star Converse Watch. The avant-garde guy might appreciate the circle in the square design. In black and brown suede straps. Other Converse Watch styles available for men and women. Quirky, but striking and colorful. B. Brilliant Sterling Silver Drop Earrings. Colorful with pear-cut, square-cut, trillion-cut, round-cut and marquise-cut cubic zirconia in sterling silver. She’ll smile every time she looks in the mirror. to some other aspect of her life. 18 inches. The Metallic Links Bracelet might have enough distinctive style to score with this gift recipient. A stretch bracelet created with smooth and textured links. In gold and silver. The Double-Wrap Braided Watch certainly stands out as different. In 3 colors. Chain links accent the braided faux leather. She probably won’t wear the Beaded Toe Ring until Spring, but she’ll love the nod to her personality. Adjustable in sterling silver. Available in other styles, like the Filigree Toe Ring. For the woman with a big, bold attitude: She carries it well. Distinctive and beautiful. Either one of these statement jewelry choices fit the bill. The colorful Lydia Multi-Strand Necklace drapes down almost to the hips. This eye-catching, long, go with almost everything necklace adjusts from 35″ to 39″. Want her to make a statement at a little less? The Multi-Strand Metal Chain Necklace also might better suit a younger or modern minded gift recipient. Excellent addition to office attire. In blue and black. The Simone Bib Necklace makes even more of a statement. Constructed of beautiful faux-tortoiseshell, it also adjusts: from 20″ to 24″. The Faux-Stones Bib Necklace also works, especially if your gift recipient has a more classic style. Beautifully transitions from office to evening event. If you need a Valentine or birthday gift (or Just Because if you’re that kind of sweetie), you can’t go wrong with the CZ Heart Sterling Silver Pendant. As long she likes hearts and doesn’t mind CZ. The CZ glistens on sterling silver heart suspended from an 18″ sterling silver chain. Basket weave design gives it beautiful depth. The 18″ Cultured Freshwater Pearl Necklace. Vibrantly multi-colored in gray, olive, brown, light champagne and dark champagne that will enhance many an outfit. A hoop earring is another choice that looks good with so many outfits. A classic at an excellent price! 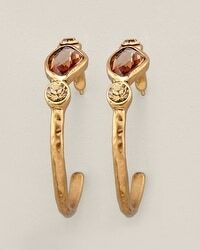 A decorative glass stud decorates the Wish Hoop Earring. Beveled beads and textured metal make the Amy Hoop Earring distinctive. These clearly accent much in her wardrobe–and look marvelous hair up or down. Onyx Rope Frame Drop Pendant in Sterling Silver works with her nice T, camisole or button down. Available in white also. Check out a matching Onyx Ring, too. The B. Brilliant Sterling Silver Circle Pendant adds color to her outfits and swings both ways: jean casual and semi-evening attire. It certainly garners attention, so could fit the GLAM gift recipient too. Clear cubic zirconias surround a London blue zirconia on a 18″ sterling silver chain. How marvelous will the Victoria Townsend Y-Shaped Necklace look with one of her cocktail dresses? The diamond accents and 18K gold over sterling silver makes it special. The crystals accenting the round face of the Gold Metallic Leather Strap help your gift recipient use at work and evening affairs. Made by Bulova in different color tones. The teal American Rag Statement Necklace is reminiscent of the glamour of old Hollywood. 20″ long. Consider the Emerald and White Sapphire Ring if she loves emeralds. It might be lab created, but this sterling silver beauty adds grace and elegance to any finger. Available in Blue Topaz, White Sapphire, African Amethyst, Opal, Blue Sapphire, Ruby Sapphire and Pink Sapphire, all surrounded by white sapphires. When you gift the jewelry, consider including a cleaner, like Blitz Gem & Jewelry Cleaner – Jar. The above Frugalista Gift Ideas show just a few of the jewelry deals from any of the retailers listed, as well as many others. That probably includes your favorite one, You’re sure to find a fit for your gift recipient. Check sites such as Retail Me Not and Bargainista, for additional savings with coupons. HAPPY POST HOLIDAY FRUGALISTA DAY SHOPPING. MAY YOU FIND THE PERFECT ACCESSORY GIFT TO DELIGHT. This entry was posted on January 11, 2014 by frugalistagiftguide in Accessories, J, K, L, Jewelry, men's, Sizzling Sales/Bargains, Uncategorized, women's and tagged Accessories, ACCESSORY SALES, bargains, Frugal, Frugalista gifts, gift recipient, jewelry deals, sale.